Radiator Springs Racers combines elements of both "dark" and thrill rides, taking riders around Ornament Valley and through Radiator Springs before sending them on a high-speed race to the finish line. Ride Capacity: Six passengers per car. Estimated capacity 1,500 riders per hour. Queue Description: The queue centers around Stanley's Oasis, which was built around a spring that formed the original settlement of Ornament Valley. Buildings in the queue, staged to look like roadside stands, provide additional details and serve as an interesting distraction during the wait. Wheelchair Transfer: riders can choose from two loading platforms depending on their specific needs. The "standard" height platform is used by passengers able to step down into the ride vehicle, while a second, lower platform is designed to make it easier for guests who need to transfer straight across from wheelchair to car. 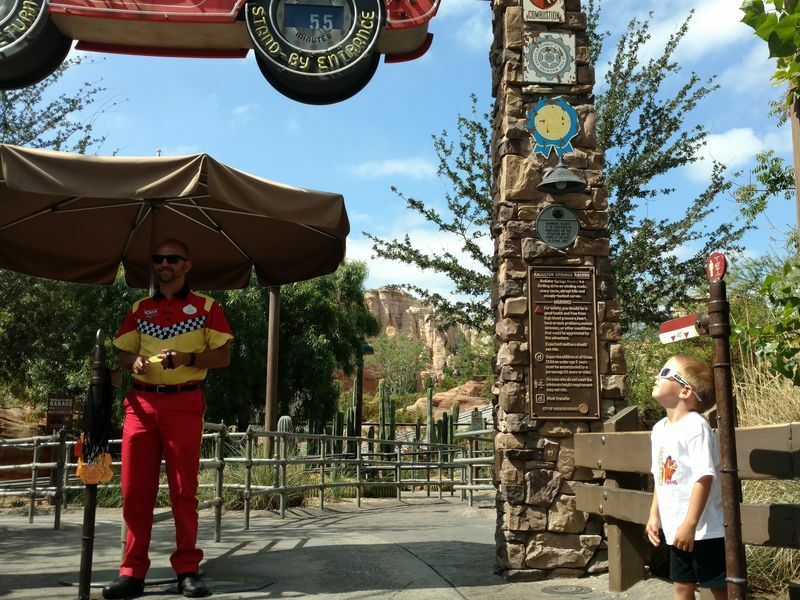 Other Issues: Lightning McQueen and Mater take turns greeting visitors outside the Cozy Cones on Route 66, and Red the fire engine usually hangs out on the path to "a bug's land," so children not tall enough to ride can still meet some of their favorite Cars characters up close. At this location: Radiator Springs Racers was part of an expansion of the original park boundaries and is in an area that was previously part of the Timon guest parking lot.